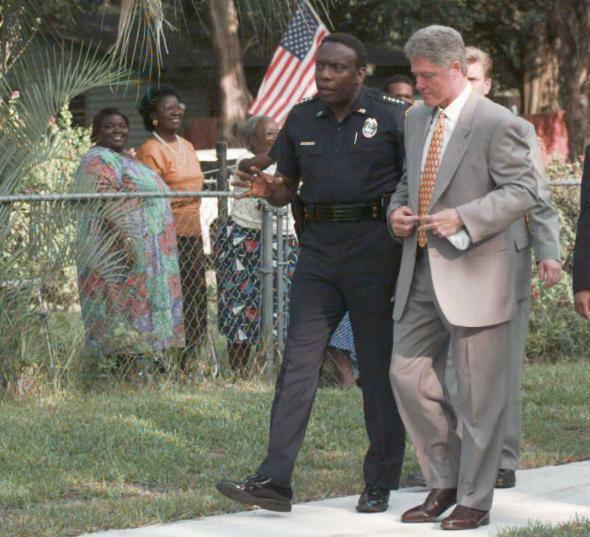 Why many black politicians backed the 1994 crime bill championed by the Clintons. Many black leaders saw the notoriously harsh law as an imperfect solution to unbearable levels of urban crime. In a pair of essays published this week, law professor Michelle Alexander and historian Donna Murch examined Hillary Clinton’s role in making the American criminal justice into the hyperpunitive monster that it is today. Both essays focused in part on the 1994 crime bill that Clinton championed during the first term of her husband’s presidency—a bill that expanded the use of the death penalty, created new three-strikes rules, and offered funding for states that made it harder for people to get parole. In Murch’s words, “Bill Clinton and his allies embarked on a draconian punishment campaign to outflank the Republicans,” while Hillary supported the effort and “stood resolutely at her husband’s side.” Alexander, the author of the influential book The New Jim Crow: Mass Incarceration in the Age of Colorblindness, argued that Clinton’s past embrace of tough-on-crime policies is one of several reasons black voters shouldn’t support her. For Michael Fortner, a professor of urban studies at the City University of New York and the author of the 2015 book Black Silent Majority, the two essays are emblematic of a tendency on the left to gloss over an important fact about the 1994 crime bill. Like many tough-on-crime policies that have been passed in the U.S. since the late 1960s, Fortner argues, the law enjoyed the support of many black activists and political leaders, who saw it as an imperfect but necessary measure to combat pervasive violence in poor black urban neighborhoods. I spoke to Fortner about the complex politics behind the ‘94 bill and why the coalition of black leaders who supported the Clintons in passing it should not be forgotten. Our conversation has been edited and condensed. I recently heard you say that undoing the disaster of mass incarceration requires a serious reckoning with the problem that triggered it: crime. What did you think of how these two essays handled that issue? If you read these two pieces, you’d get the sense that crime policy was not developed to solve any problem, that these laws were created just to put away black folks. In many ways, I started my journey in this literature because I thought the dominant scholars were completely ignoring the effects of crime on people’s lives. I grew up in Brownsville [a high-crime neighborhood in Brooklyn], and I remember what crime felt like. And these academic discussions, these ideological discussions about crime, completely ignore the terror in the streets. They completely ignore how crime shaped whether you went to church at night or how you felt coming home from work. Once you add that to the picture, I think crime policy becomes less suspicious. That doesn’t mean it becomes less problematic. These were dumb policies. But they begin to have a logic that is not strictly tied to racial or economic imperatives. It begins to have a logic that’s tied to people wanting to live normal, safe lives in urban communities, and politicians who responded to those pleas for greater public safety in ways that also lined up with their own political interests. ﻿How bad was crime in America when Clinton became president? When he came to power there was a sense that crime had reached insane levels. People in urban communities were afraid to go out. By this point a lot of middle-class African Americans who were able to leave these neighborhoods had left, so you had a lack of civic organization, the housing stock was miserable, and there was just sort of a lot of despair and fear. And the crack epidemic was coming to a head at that point. You had gang violence over the drug trade. It was just a desperate situation for many urban African Americans. In her essay, Alexander argues that Bill Clinton embraced crime as an issue because it helped him win the votes of white people who were straying from the Democratic Party. What do you make of that argument? I think Alexander is right when it comes to this point: Clinton was shaped by the changing dynamics of party politics in the late ’80s and early ’90s. And it is true that Clinton and other Democrats were concerned about working-class whites who were leaving the Democratic Party, and they wanted to develop messages that would appeal to them. “Tough on crime” was one of those messages. So, it is true that Clinton pursued this in order to achieve those political objectives. But it’s also true that he wanted to solve a real problem—one that disproportionately affected minority communities. In hindsight, the law can be seen as a continuation of policies that, decades earlier, started the U.S. down the path of mass incarceration. To what extent did black political leaders see it that way at the time? Well, in 1973, in New York, many black activists pushed for drug laws, and in the ’80s many black activists pushed for punitive crime policies and supported aspects of Ronald Reagan’s war on drugs. When Reagan signed the Anti-Drug Abuse Act of 1986 into law, the one that created the crack-cocaine disparity, Charlie Rangel was onstage with him. And at the time they pushed this because they thought previous policies were not doing the job and that they needed to get tougher on the drug problem in urban communities. And as the drug problem worsened, many of them continued to push for more punitive policies and more aggressive policing. I think they saw these things as inadequate but necessary solutions to very urgent problems. And I think they did not foresee the unintended consequences of those policies. … They thought they would stop the violence. And they thought they needed some type of mechanism to create safe streets for people who were not committing crimes, who needed to go to work, who needed to take their kids to school. And this speaks to the urgency of the situation—yes, they realized there was a host of other structural issues going on and they wanted remedies for those things, but they also felt like life in the inner city was just untenable. People were unable to live normal lives. Can you say more about the coalition of black activists and leaders who supported the ’94 crime bill? Who were they? There were different levels. On one level, there was grassroots mobilization of the community, particularly by black pastors. There was a group of influential black pastors who signed a letter encouraging the Congressional Black Caucus to support the bill. And then later, on top of that, black elected officials, who portrayed themselves at various points as uncomfortable with some of these laws, went along anyway because of pressure coming from their communities, and because they also realized the problem was so bad. And sometimes their support or opposition was really related to party politics, whether or not the politician pursuing the law was a member of their party, or whether supporting the law would benefit their own political and electoral interests. So it’s a complicated mix for them, in terms of their motivation. Some people have noted that Jesse Jackson, for instance, was against the ’94 crime bill. How common was that point of view in black political circles? Was it widely believed that the ’94 law would end up being worse for black communities than the crime it was supposed to remedy? There were certainly liberals who opposed some elements of the bill, particularly the death penalty element and the three-strikes element. Jesse Jackson is interesting because he was throughout that year opposed to the bill—that’s true. But many black leaders didn’t agree with everything in the bill at first but made peace with it despite their misgivings. There’s an interesting quote from the letter those pastors wrote to the Congressional Black Caucus: “While we do not agree with every provision in the crime bill, we do believe and emphatically support the bill’s goal to save our communities, and most importantly, our children.” A group of 10 black city mayors also supported the bill. So while there was some opposition in the black community, there was also significant support. Many of the members of the Congressional Black Caucus did try to get rid of some of the more punitive elements in the bill, but in the end they decided to go with the president and support the final bill. What I can say is that comparing the reaction to the Rockefeller laws in 1973, to the war on drugs in the ’80s, to the crime bill, there was a growing awareness that the community needed to be careful about running to police and prisons for solutions and that they were beginning to have devastating effects. In fact, Kweisi Mfume [a congressman from Maryland who served as chairman of the Congressional Black Caucus] suggested in 1994 that the crime bill might lead to the incarceration of large groups of African American men. But he still supported the bill. So even though there was this awareness among some, many of them—both for reasons related to crime and because of their own political relationships with the Clintons—decided to support the bill regardless. So how should we think about the Clintons’ record on criminal justice, in light of what you’ve said? How do you think people looking at Hillary Clinton as a presidential candidate right now should view her and her husband’s legacy on this issue? For me it’s not a question of how I’d like people to view their legacy. It’s more about how I think we should frame the questions about their legacy. Going back to something I said earlier, I think we should consider unintended consequences. There’s a way of talking about these things where you argue that the Clintons meant to do this—“this” being mass incarceration of African American men. Now, there are a variety of moral and political implications to that claim. But if you believe that the Clintons—like many African American leaders—supported these policies for their own political interests, as well as to help the black community, and that they never intended the outcomes that occurred, that leads to different moral and political implications. We need to have a more complex understanding of the origins of these policies. *Correction, Feb. 25, 2016: Due to a production error, this piece’s photo caption originally misstated that the photo was from 2005. It is from 1995.